At times, I’m a relatively simple person. If something interests me, I truly want to see it for myself. 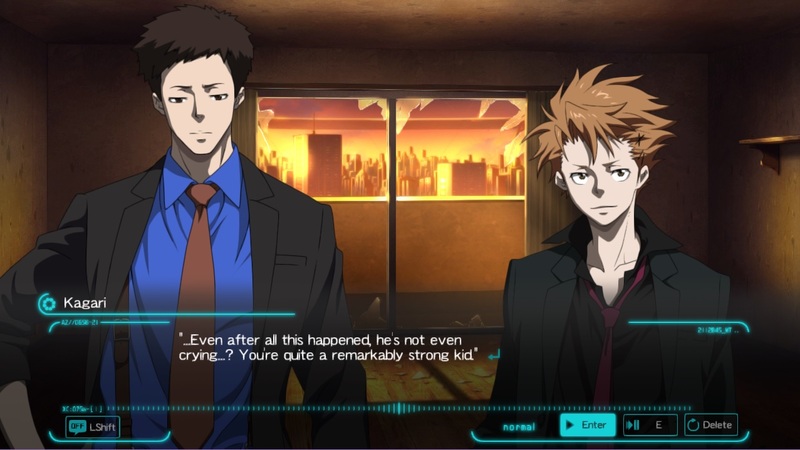 That’s no different with Psycho-Pass: Mandatory Happiness. Despite not having seen the anime, the concept of it piqued my interest. As this is a re-review, I’ll mainly talk about my thoughts in terms of its setting and narrative. I’ll leave out discussion of overall plot and gameplay as mentioned in the last review, to avoid repetition. Now, does the story do dystopia well enough? The setting does cover some familiar territory. The government enforces a social code to benefit society as a whole. However, it causes more internal problems than it solves. Then the narrative goes into how the system is at fault. Plus, the story looks into the roles of happiness and sorrow in society. This could have been an issue depending on how much one is familiar with dystopia. After all, media as a whole played with this idea quite a bit more recently. Yet, there are a few ideas that do make the setting stand out. While the novel does deal with how the system can be a problem, it also delves into how it can be necessary to benefit society. Also, the setting delves into human choice and its consequences in an interesting way. The narrative doesn’t either fully condemn or glorify full human choice. Instead, it focuses on how emotion plays into our daily lives and develops us as a person. The novel’s antagonist is not truly evil as well. Instead, he serves as a direct counterpoint to the system society has enforced. His relation to the chosen protagonist affects both sides in truly great ways. The fact he also feels failure allows him to come across as genuine. This resulted in a very believable antagonist, one you can take both seriously and even pity. Overall, at points, I did feel a couple of the characters didn’t truly shine as much as they could. The three original characters, Takuma Tsurugi, Nadeshiko Kugatachi, and the antagonist all felt well-developed. After all, they are the most prominent in the story. Other characters such as Ginozo, Kogami, and Kagari also felt rather natural. However, characters like Masaoka and Kunizuka felt like they were mainly there either for a simple chat or provide more exposition. This is not a deal-breaker but was rather noticeable. As for the narrative itself, the story’s subtlety has quite a few issues. The last review spoke of how the database can spoil certain plot-points. However, the experience is not subtle enough in general. 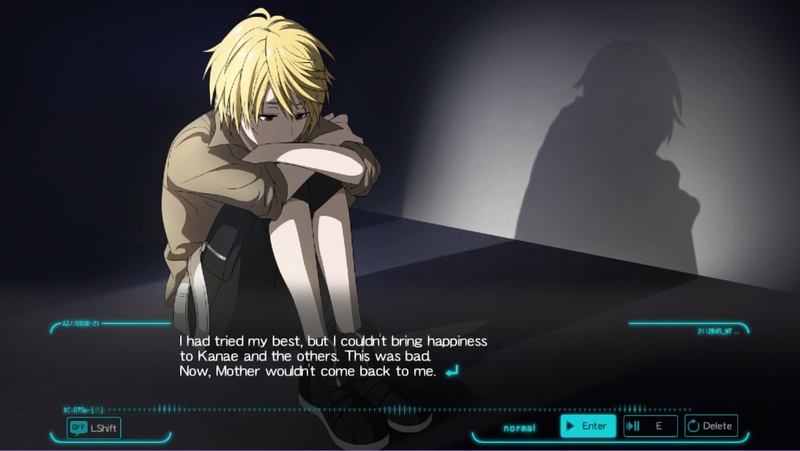 Character interactions, event scenes, and the chosen character’s perspective are blatant as to what they are foreshadowing. At points, I can easily guess what reveals will happen. This caused me to become impatient where I wished they did the reveal so it is over with. Maybe I’m just too genre-savvy but I seriously doubt that. The soundtrack is hit or miss. Energetic and soothing themes are well-composed and perfectly represent the scene. Fear-inducing tracks, however, were more ear-grating and used too commonly. The sound-design also needed adjustments. Sometimes, the novel plays a certain lullaby throughout the narrative. Due to compression, it sounds off. Plus sound effects can drown out music and voice-clips. Both of these issues more often than not ruined immersion for me. Visually, the experience is fine as characters and backgrounds are drawn very well. However, at points, the experience might not use images to their full effect. 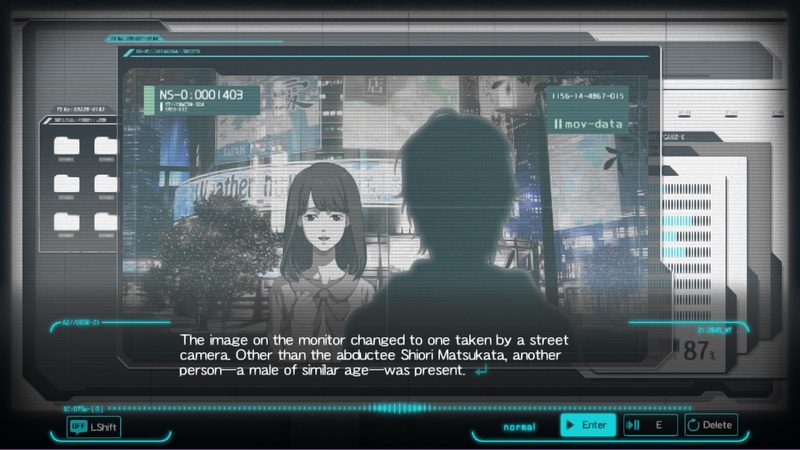 It might feature an image with a character on screen without using a designated portrait where an action is taken against the character, such as shoving or dragging. While the character’s facial expression would change, nothing else does, so the effect feels rather cheap. Sometimes the novel will use cut-ins of a character portrait to provide an action scene with more energy. However, I feel this is more of a distraction. As for the save glitch mentioned in the last review, I never encountered the issue on the PC version. The text displayed correctly as normal. As far as my experience goes, there were no technical issues. 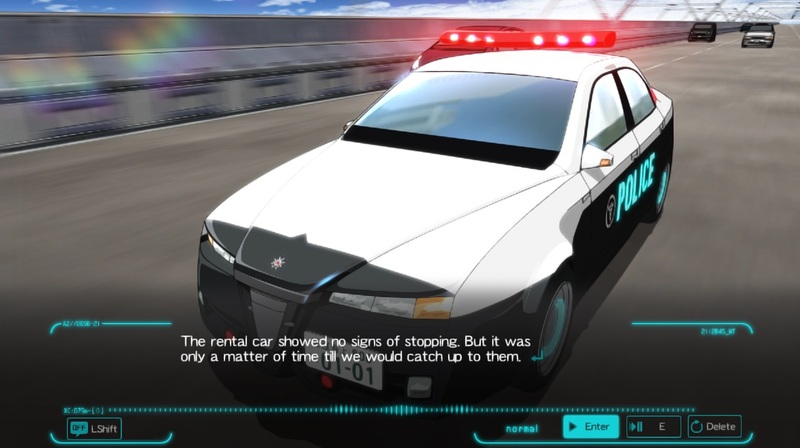 In general, I found Psycho-Pass: Mandatory Happiness as a good example on how to do dystopia right. Its setting provided a proper argument on the course of humanity. It highlighted both the good and the bad with a plot that is still very mature and believable. The characters were truly diverse, even if they weren’t complex. The antagonist was a great counter-point to the social system enacted as well as generally pitiable. Honestly, I may want to see the anime now. It might be a good experience if this said anything.